The second commission for the Franklin Marriott Hotel and Conference Center shipped to Atlanta recently. The Soho Myriad framers are hard at work constructing box frames before sending the work on to Nashville for final installation. Kelly M. O'Brien, Playing With Fire No. 16 - 20, work in progress. Paper, gold leaf, flame. Dimensions variable. ©2015. 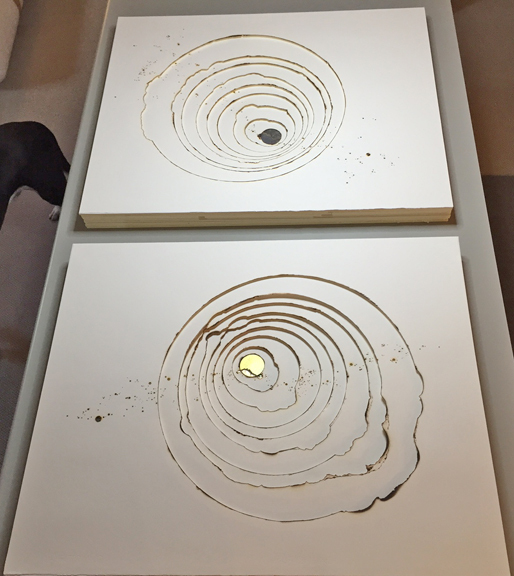 These pieces are different from the first commission of two circular forms. For this second project, the client wanted straight, angled pieces to hang as a group of five—an interesting challenge because the individual pieces have to relate to one another once they are installed on a large wall. Wide matting is being added to expand the framed sizes. This will further change the relationship of the pieces to one another, so I had to allow for "give" in the design. Kelly M. O'Brien, Playing With Fire No. 17 - 20, work in progress. Paper, gold leaf, flame. Dimensions variable. ©2015. The individual pieces range from 20”h x 27.5”w (38”h x 46”w framed) to 24h" x 30w" (46”h x 57”w framed), and are ten layers deep. So the finished box frames are approximately 4" deep. Kelly M. O'Brien, Playing With Fire No. 19, work in progress. Paper, gold leaf, flame. 30 x 24 inches. ©2015. Speaking of framing, it's a key part of the process. I wanted a more open feel to the work, so the layers progress large to small, bottom to top. This makes for very tricky work to stabilize and mask the edges for a clean look. I'm grateful that Andrea Emmons and her framing team at Soho Myriad have the experience and confidence to handle this. When I get images of the framed, hung work installed on location, I'll share them here. How I love the combination of art and text! The influence of the book arts has never really left my work, as I'm always fighting the urge to add text to my paintings, prints and sculpture. Happily, the two will coexist in an upcoming group exhibition that includes several of my Hard Tryer pieces. 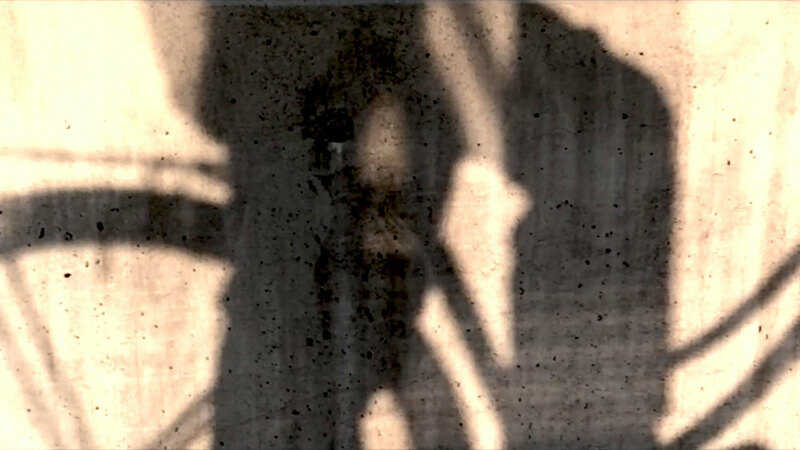 Curated by Graeme Hobbs and Robert Lee, the exhibition will be at 44AD ArtSpace in Bath. Last week I launched an online shop for my New Country series on Etsy, the world's largest online marketplace for makers and people who love fine handmade goods. After a positive debut for the work at this month's Bath Artisan Market and people asking me if it was available online to buy, I decided to open this new shop. You'll find fun gifts for the cow, sheep and chicken lovers in your life, or maybe a little Modern Farmhouse décor for your own kitchen. For now, I'm offering high-quality art prints, greeting cards and postcards, all created from my original paintings. Other products are underway, including farm animal flag buntings. For my first ten customers, you get a 25% discount and a special thank you gift. Please use coupon code FIRST10 when you check out. I take it as a good sign that I woke up the day after the shop launched to a sale from a dairy farmer in Maryland. The holidays are just around the corner. If you want to take advantage of inexpensive international shipping rates from England, shop now! Kelly M. O'Brien, Playing With Fire No. 14 (detail). Paper, gold leaf, flame. 30 x 24 inches. ©2015. I'm very pleased to share that I just completed two commissioned pieces for the Marriott Hotel and Conference Center in Franklin, Tennessee. They are larger versions of the Playing With Fire work that I did in 2013 to exhibit as part of Marseille-Provence Culture Capital 2013 programming. The two commissioned pieces are much larger (30 x 24 inches) and will be matted and mounted in 3-inch deep box frames to become 72 x 54 inches. They will hang on opposite walls in a corridor at the conference center. I'm very eager to see final installation photos! Kelly M. O'Brien, Playing With Fire No. 14 and No. 15. Paper, gold leaf, flame. 30 x 24 inches each. ©2015. Scaling up to the larger size was a challenge. Not only are the materials trickier to work with, but there's a lot of smoke involved. Because the work is created by burning the paper, I couldn't do it in my studio indoors. We have an semi-finished stone outbuilding on our property that I converted to a temporary studio. It's dry and clean enough, after some elbow grease, to be suitable for this paradoxically messy yet pristine kind of work. Playing With Fire explores the tension between control and letting go. Fire as a medium forces me to let go – it is unpredictable, and simultaneously destructive and creative in how it interacts with paper. Fire also represents a fine line that fascinates me about what we allow ourselves to have in life. How can we have light, heat, spark and glow without self-destructing? As black and white as this work appears, for me it's all about finding a happy medium. As I entrusted the carefully packaged work to the nice FedEx International shipping men yesterday, I said a silent prayer to Hermes that they arrive in good shape to the framers in Atlanta before their final journey to Nashville. Special thanks to Shannon Douglas at Soho Myriad, the fine art consulting firm who brokered the project. I look forward to doing more! Both pieces ready for packaging (and tail end of my studio assistant, Astro, left). Kelly M. O'Brien, Playing With Fire No. 14 and No. 15. Paper, gold leaf, flame. 30 x 24 inches each. ©2015. 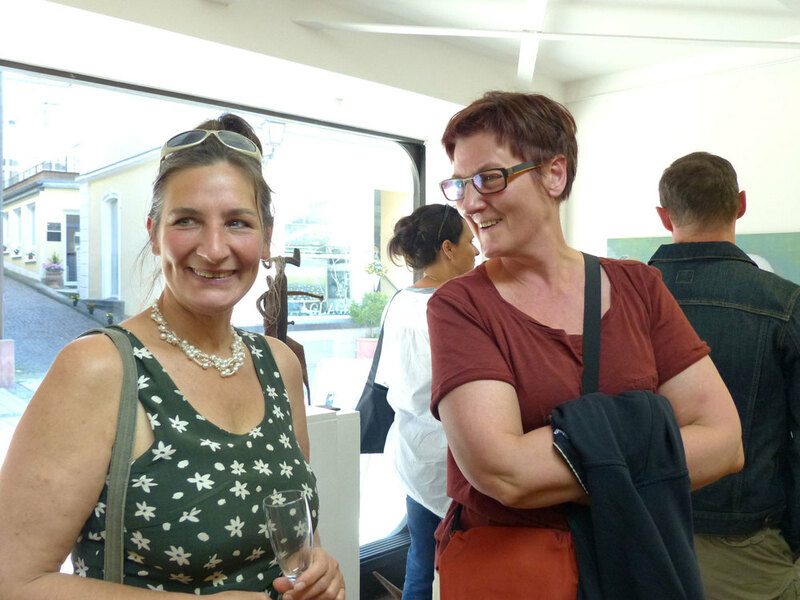 The artists were all present at Friday's Galerie Uhn Vernissage for the artist is not present, along with a fine gathering of friends, collectors, and Königstein locals. The exhibition features an installation of Lichtobjekte by Katja v. Ruville, scrapmetal sculpture by Chris Kircher, videos and an installation by Claudia Grom, and overpainted photographs by Kelly O'Brien. Presence took some effort. Kelly drove from her home near Bath, England to deliver new work and help install the exhibition during the week. 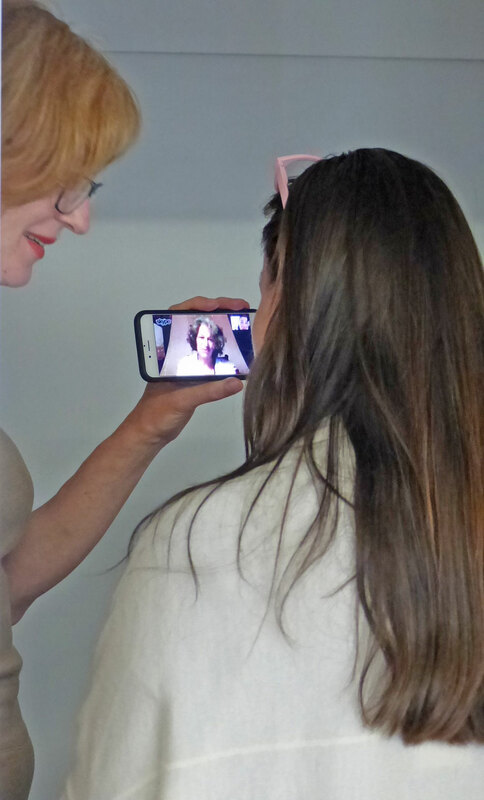 Claudia navigated a six-hour time zone difference from her current location in Bali, not only to direct the installation of her work, but to participate by Skype in the Vernissage. Many thanks to everyone who came out to the Taunus for the event! We are especially grateful to Frau Jimin Leyrer of Galerie Uhn for mounting our exhibition and hosting the event. Special thanks to Pat Roth for the photographs. 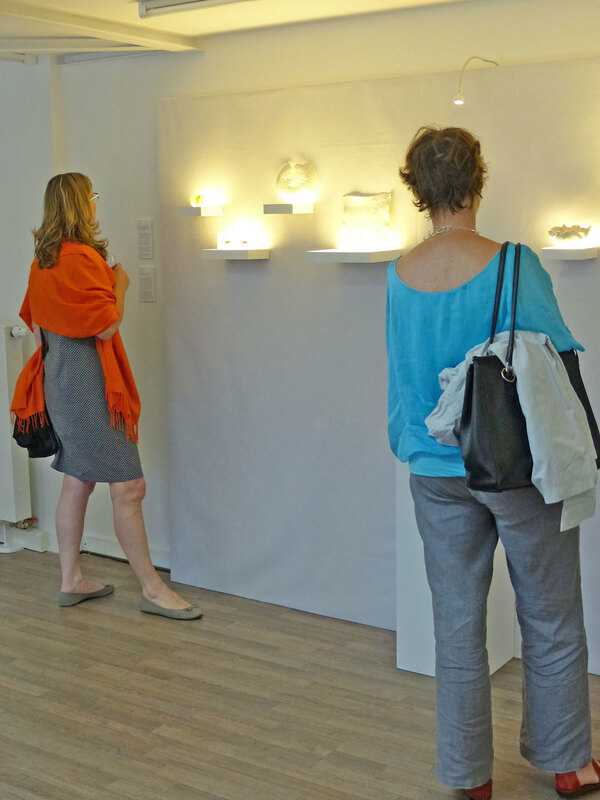 Our work is available at the gallery until August 28th. 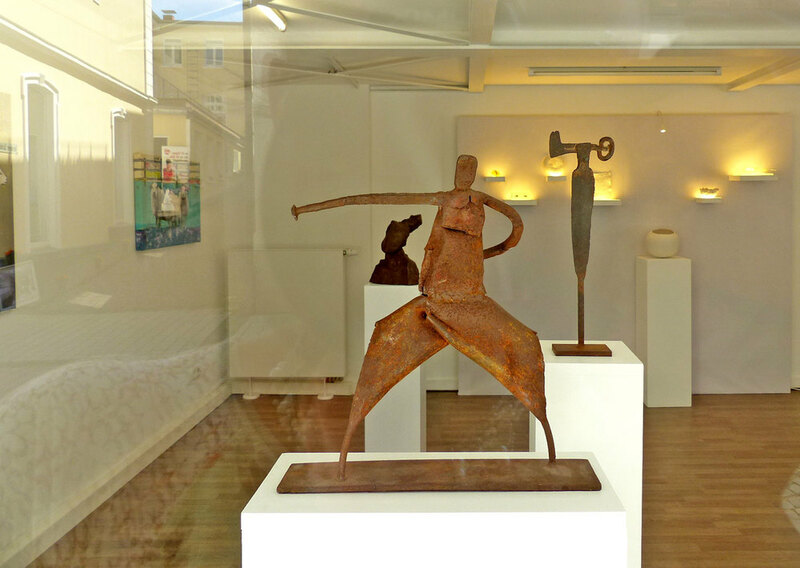 Opening hours are Tuesday through Friday, 12:00 - 17:00 and Saturday 10:00 - 13:00. Galerie Uhn is closed for summer holiday July 31 - August 15. We invite your presence! Please stop in, bring a friend, and enjoy a cup of green tea while you browse. Next up for the Joint Portfolio Project: The National Institutes of Health Gallery in Bethesda, Maryland. The exhibition opened last Saturday and runs through September 11. We are also preparing for our next stop at the Bristol Art Museum in Bristol, Rhode Island. 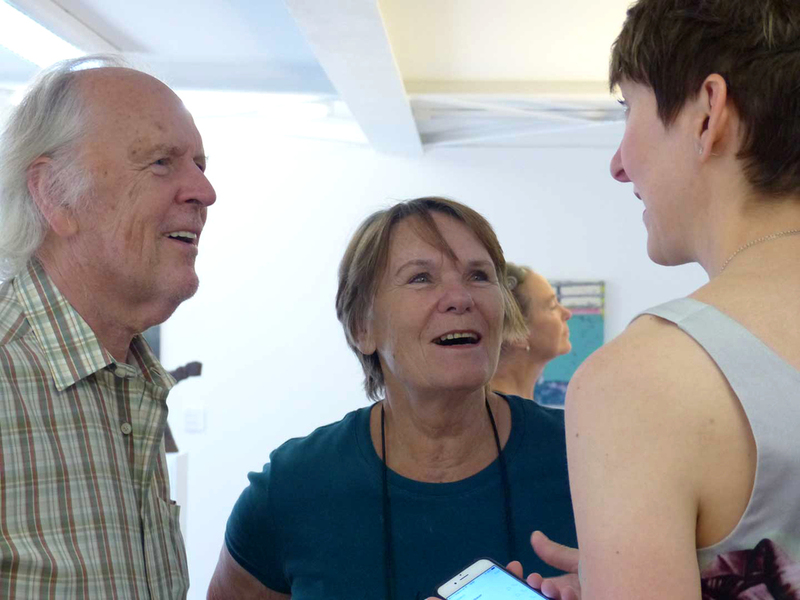 The project's founder, Carol Strause FitzSimonds, recently interviewed me. She is preparing for a discussion panel on the project, to be hosted by the museum as part of the Opening events. CSF: Why did you do this portfolio project? KO: My situation is a bit different in that I am a former Printmakers, Inc. member who lives overseas. It felt great to be invited and I saw the project as a way to continue my relationship with the studio. When I was a member, we did something similar for the group's 35th anniversary and it was very rewarding. CSF: What did you personally get out of the experience? KO: Continued connection to a group of artists that I like and respect. An introduction to the talented printmakers of the Providence Art Club. Exposure for my work in ways I could not have garnered on my own. The satisfaction of being part of something beautiful and professionally done. CSF: How much of your time was required to meet this committee? Biggest challenge? KO: Developing and producing the print edition took about a month. I've also helped out with marketing by managing the project's Facebook page, which has been fun. The biggest challenge has been being so far away! I wish I could be at all of the exhibitions and meet other artists who are part of the collaboration. I am pleased to announce our second exhibition as a group with my German colleagues Chris Kircher, Claudia Grom and Katja v. Ruville. The artist is not present opens this Friday, July 10 at Galerie Uhn and continues to August 29. The title plays with the idea that presence does not have to be physical. Two of us are currently not or are no longer living in the Frankfurt area. We have remained committed to a shared vision and professional practice of our work as presented in our first exhibition to be continued. Since then, we have continued to collaborate and support one another virtually through regular Skype meetings, bi-annual retreats and group exhibitions. Over the past year, we have each had our own personal experience of what “not being present” means, reflected in the work. Whether it is relocating to a different country, traveling the world with a long term art project, retreating into one’s inner world, or working in other fields – each development has stretched, as well as enriched the group's bond. 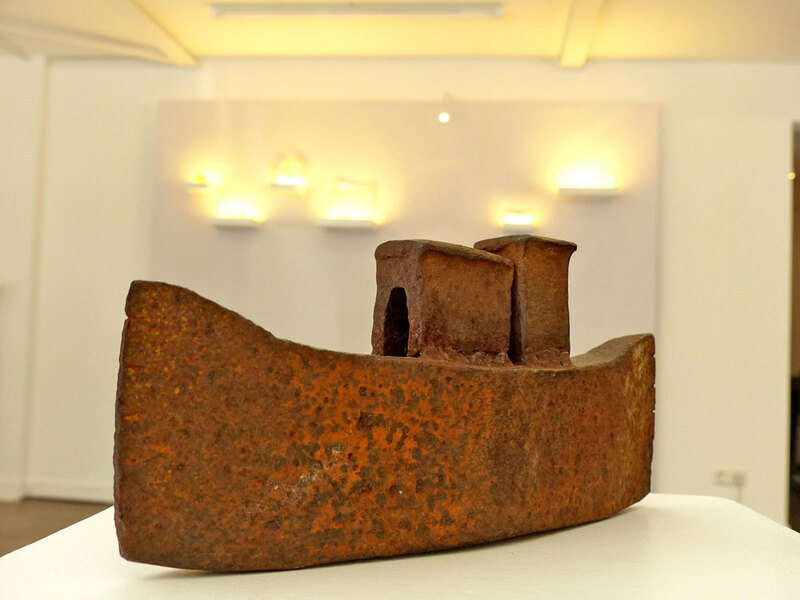 Exhibited work includes scrap metal sculpture by Chris Kircher, porcelain and light objects by Katja v. Ruville, an installation combined with live performance art from Asia by Claudia Grom, and some of my New Country work. The artists will be present. If you are in the Frankfurt area, I hope to see you there! Next stop for the Joint Portfolio Project, Hoxie Gallery in Westerly, RI. Thanks to the Westerly Sun for a nice article about the exhibition! One of the things I love about living in another country is exposure to art and artists that I might not otherwise find. 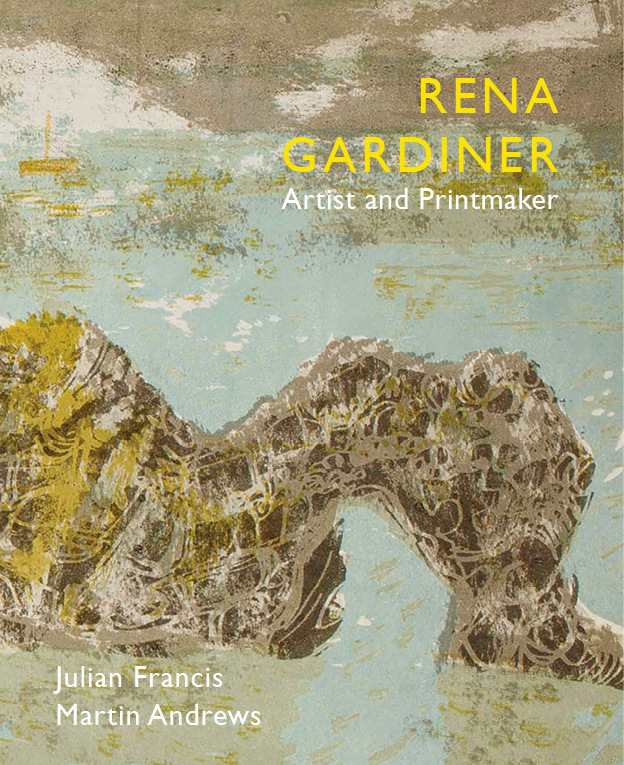 My current British Artist Crush (BAC) is Rena Gardiner, an artist and printmaker who lived and worked in Dorset (1929 - 1999). Her work captures some of the things that really appeal to me: inspired, whimsical landscapes; delicate line; color combinations that are unexpected and lush; translucency and layers. Love! Just as remarkable is that she was apparently a one-woman DIY publisher of her 45+ books, which she illustrated, printed, bound, and distributed on her own. Makes modern day, crowdsource-funded self-published books look easy by comparison! A new book about this unsung heroine is now out, available through Little Toller Books. The little portfolio that could is still going! Our next stop for the traveling exhibition of framed prints from the collection is Candita Clayton Gallery in Pawtucket, Rhode Island. Most, if not all, of the boxed portfolio sets have been sold. Thirty-one individual framed prints are still available (one from each artist), and some artists are showing additional work as well. We're getting settled into our new home, here in the English countryside. The tiny village of Stanton Prior has welcomed us warmly, and the local winter hasn't been one to complain about (sorry, East Coast friends!). Astro enjoying daffodils in February! 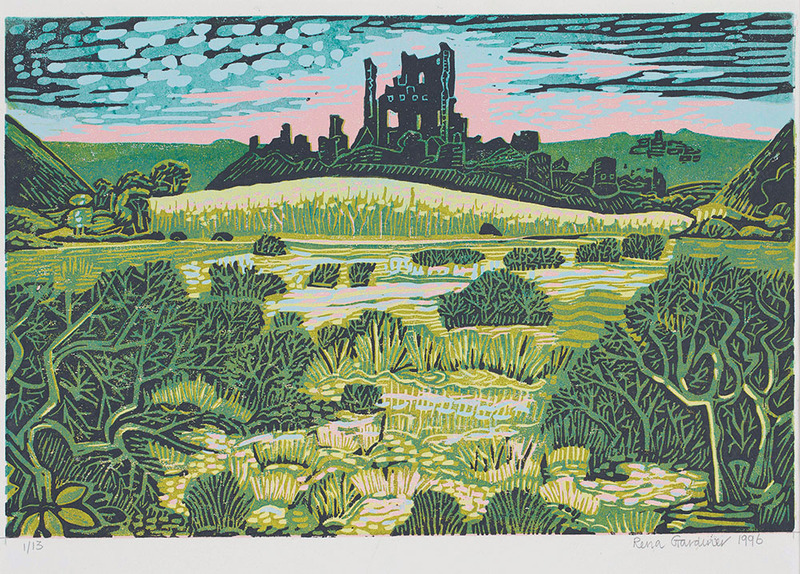 The scenery consists mostly of rolling fields, hedgerows, Constable skies and farm animals. 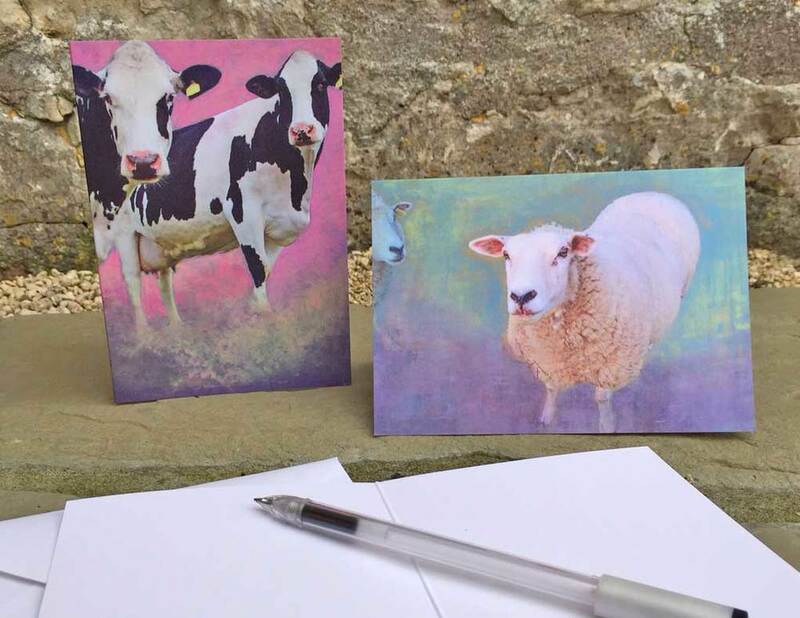 There are two working farms in our village, and my studio views include cows, sheep, ducks and chickens. It's captivating, entertaining and uncomfortable. Who knew that moving to an English-speaking country could feel so foreign? Three months in, I'm at that awkward stage between meeting new people and forming meaningful relationships. Culture shock is a fact of life, even when you speak the language. Building friendships, not to mention a local network for my work, will take time. This will pass, I know - it was like this when we moved to Germany. And as uncomfortable as this phase is, it's also an opportunity. Soaking up my immediate surroundings with fresh eyes will only last for so long before things look and feel more familiar. I'm trying to capture the moment in some of my recent work. A few new studies, New Country, reflect what's going on, in more ways than one.